One of my very favorite parts of the holiday season is the cookies. There are, of course, new recipes every year that I've just got to try. But, there are also those traditional cookies - the well loved, tried and true ones that evoke Christmases past. For me, this cookie falls into both categories. It's a recipe I've never tried before, but the flavors are classic and Christmasy. These cookies have made the list of ones that I'll be making in years to come. Pfeffernussen are traditional German holiday cookies - the name means pepper nuts. And yes - they really do have black pepper in them (which is what caught my eye about these - my husband and kids are huge pepper fans). The flavor is subtle, though - it definitely adds something and would be missed, but it isn't really anything you'd notice if someone didn't tell you it was there. The cookies themselves are soft and spicy - quite tasty. This recipe is adapted from one at Martha Stewart. These cookies require quite a few spices, but are very easy to make. And they're special - definitely deserving of a spot on your holiday cookie platter! This cookie is being entered in the White Christmas Very Good Recipes Challenge at white-christmas-challenge! 1. Preheat the oven to 350°. Line baking sheets with parchment paper. 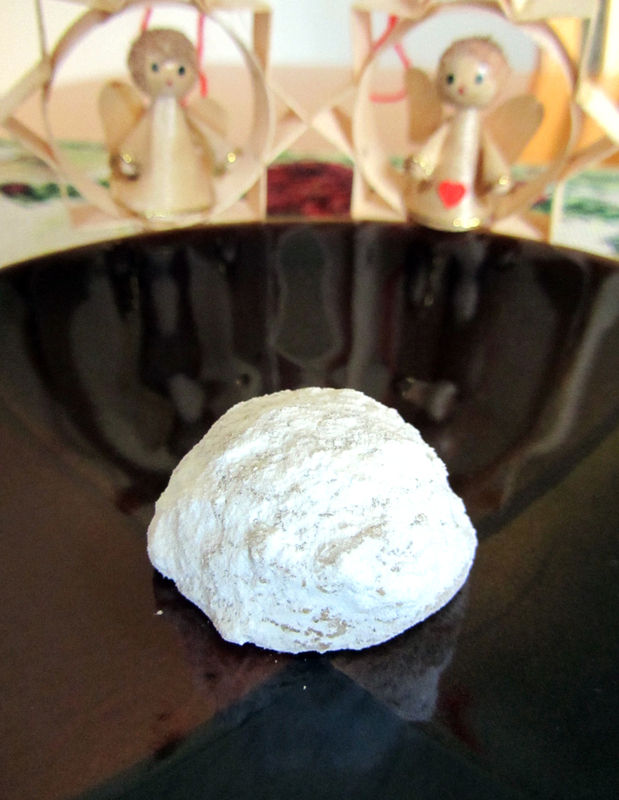 Place the powdered sugar in a medium bowl or paper bag. Set aside. 3. Combine the butter, sugar, molasses, and honey in the bowl of a stand mixer. Beat until creamy and well-blended. 4. Add the egg and vanilla to the bowl. Beat until thoroughly mixed, stopping to scrape the sides and bottom of the bowl. 5. Add the flour mixture to the bowl. Beat on low speed until the dry ingredients are just incorporated. 6. Scoop tablespoonfuls of the dough onto the prepared baking sheets, leaving about 1" in between each. 7. Bake for 9-10 minutes or until the bottom edges are golden and the centers are fairly firm. Transfer the sheets to racks to cool for five minutes. 8. Working in batches, transfer the par-cooled cookies to the powdered sugar bowl or bag. Seal the bowl with plastic wrap or close the top of the bag. Gently tumble to cookies in the sugar to evenly coat. 9. Transfer the coated cookies to a plate. Serve! "Ships that pass in the night, and speak each other in passing, only a signal shown, and a distant voice in the darkness; So on the ocean of life, we pass and speak one another, only a look and a voice, then darkness again and a silence." Crochet? Check out my blog!